As the newest firmware update for Apple idevices, iOS 8.1.3 version has pushed out for the public in few days ago. Then, most of the users are looking for iOS 8.1.3 jailbreak, because of Cydia. They want upgrade their devices to latest iOS 8.1.3 with Cydia download for it. After released 4th beta of iOS 8.2 for developers, Apple has decided to out their next firmware update to the public as iOS 8.1.3. With this software update, Apple presents some improvements and bug fixes for iPhone, iPad & iPod. The major & important thing we have to consider, Apple has blocked jailbreak for iOS 8.1.3 by this update & restrict Cydia download. Cydia download is possible for iOS 8.1.3 ? No. This time, Cydia is not available for iOS 8.1.3 version. Because, there is no iOS 8.1.3 jailbreak for download & install Cydia. You know, jailbreaking is the only method to get Cydia on iOS devices. The company Apple has discovered & patched most of the exploits that were early used by the jailbreakers by this software update. Like in earlier, Pangu8 jailbreak was closed by the software update of iOS 8.1.1, this time TaiG & PP jailbreak which are supported to download Cydia up to iOS 8.1.2, were killed by this iOS 8.1.3 maintenance update. That’s mean; both above tools cannot use to Cydia download & install process for iOS 8.1.3 (iOS 8.1.3 jailbreak) running idevices. At this moment, Cydia is not supported for iOS 8.1.3. However, you are able to Cydia download up to iOS 8.1.2 versions. Except iOS 8.1.3, all available iOS versions are covered by the Cydia through several jailbreak solutions. iOS 8.1.2 is the latest iOS version which is Cydia compatible. iDevice users, those who are wanted amazing Cydia, stay on iOS 8.1.2. Then, you can use TaiG or PP jailbreak for Cydia download your iOS 8.1.2 devices. Windows users – How to get Cydia for iOS 8-8.1.2 devices using TaiG jailbreak? 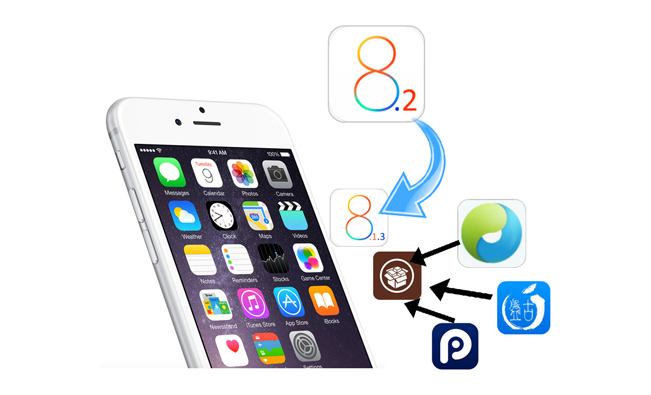 Mac users – How to get Cydia for iOS 8-8.1.2 devices using PP jailbreak? What will be the next iOS update? Most probably it will be the iOS 8.2 – the biggest update of iOS 8. However, if it is iOS 8.1.3 jailbroken, Apple will pull back iOS 8.2 and try to kill jailbreak and Cydia download for iOS 8.2. Because; they will take each & every efforts for keep iOS 8.2 away from jailbreak & Cydia. iOS 8.1.3 is not a stable major version. It is only for the maintenance & testing purpose. So, our point of view we do not much consider about jailbreak iOS 8.1.3, because important iOS 8.2 version coming soon. If someone early exposed exploits of upcoming iOS, then jailbreak iOS 8.2 will become harder. Stay with iOS 8.1.2 and keep your jailbreak with Cydia. iOS 8.2 coming soon…..
Are you agreeing with us? Comment your idea. How to upgrade iDevices to iOS 8.2 as jailbreakable for Cydia? What is the best jailbreak tool for Cydia iOS 8+? 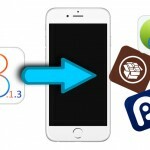 ‹ Is Openappmkt Cydia installer can install Cydia ? I’ve been a jailbreak user since Evasi0n was taking over and leading the jailbreak season. I’ve been on early version as of 6.1.2. I’m trying to jailbreak my fiancee’s ipod since she started to like the things that jailbreak tool gives out and i’m just waiting on an update on the jailbreak tool for the latest version. I’m just crossing my fingers that you guys make it possible to make it happen. I’m still running on the latest jailbreak tool but waiting on an update. I see your point of view and with the high urge of the new jailbreak update coming soon, i hope you guys make it possible to make this happen. Cydia not compatible with iOS 8.1.3. Because, there is no jailbreak tool release yet for cydia download. You must have to wait…..
Now you are unable to get it for your device. Touch with us..
Can you help me? I codnt know how to download Cydia!!! Tengo instalada iOS 8.1.3 , saben si ya está la actualización del jailbreak par a 8.1.3 disponible? Desde ya muchas gracias. Cydia not support for iOS 8.1.3 yet. iOS 8.1.2 is the highest version which available Cydia. most probably jailbreak will not release for iOS 8.1.3 at this time. Because, major iOS 8.2 come soon. After released iOS 8.2 to the public, jailbreak for Cydia will be released both iOS 8.2 & iOS 8.1.3 versions. This moment Cydia is not available for iOS 8.1.3 running devices. Wait and touch with us.. You can install Cydia for latest firmware recently. Why ios8.1.3 can not jailbreak now? Download complete guides to get Cydia.